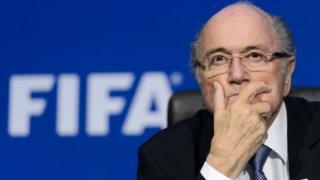 Sepp Blatter's 17-year reign as head of world governing body Fifa has ended in ignominy after the world body's ethics committee banned him for eight years. For months football's most powerful man has been weighed down by a slew of corruption allegations. He has always denied the allegations, and will appeal against the eight-year ban, but it seems impossible for him to continue as Fifa president now. Media captionMr Blatter said he was "sorry that I am still somewhere a punching ball"
He was banned for allegedly signing a contract "unfavourable" to football's governing body and making a "disloyal payment" to Uefa president Michel Platini, who has also been suspended for eight years. The ethics committee launched its investigation after the Swiss attorney-general began its own investigation into the disloyal payment - and this is still ongoing. The embattled Fifa head had already announced earlier this year that he would be stepping down as president next February following the indictment of key Fifa officials on corruption charges by the US justice department. Sepp Blatter's troubles, however, do not stop there. He is also being investigated by the ethics committee over allegations surrounding a 2005 TV rights deal between Fifa and Jack Warner, the former president of Concacaf, the governing body of football in North and Central America and the Caribbean. His decision in June to resign early came as a surprise. Days before, he had been re-elected for an unprecedented fifth term and had insisted he was the man to lead reform at the organisation. But the dramatic arrest of Fifa officials in their Zurich hotel rooms as they gathered for a congress on 27 May cast a dark cloud over his re-election. What drove a man, soon to be 80, through four terms in such a high-profile, and highly scrutinised, position? When he was first elected as Fifa president in 1998 there was a certain amount of national celebration in his home country, remembers Roland Buechel, a Swiss member of parliament and campaigner for more transparency at the top of football. But that is precisely where some of Mr Blatter's critics disagree. "He has had 17 years to improve governance at Fifa," says Eric Martin, head of the Swiss branch of the anti-corruption NGO Transparency International. And while some old friends describe him as down to earth and open, others who have worked with Mr Blatter say he resents opposition, pointing to the swift departure of Fifa colleagues who dared to question him. Mr Blatter had bluntly turned down a suggestion of a television debate with candidates standing against him. BBC World Service: Who Can Fix Fifa?